Medicaid, a state and federal partnership forged in the 1960s, provides care for 50 million poor men, women, and children in the United States who would otherwise have no access to health care. 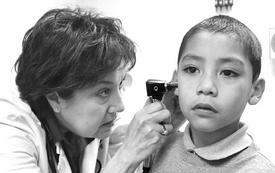 Medicaid takes care of children whose parents work at places like Wal-Mart that don’t provide health insurance. It pays for nursing home care for our elders. It covers treatment for disabled children and buys medications the poor and elderly would otherwise have to do without. Rather than heeding the call from states to strengthen Medicaid, Bush is attempting to destroy it. Bush plans to cut $60 billion, about 2 percent, from projected Medicaid spending over the next decade. At a recent meeting of the National Governors Association, the governors rebuked this unprincipled slashing of funds. Bush has the Medicaid program under full assault, masked by Madison Avenue tactics. Bush aims to “block grant” Medicaid back to the states. This means governors could use Medicaid monies for programs other than health services. When Bush proposed this in his first term, the block grant idea was so unpopular that even Republican governors opposed it and it died a quick death. It’s back. Many Republican governors still oppose it. But states are now more strapped for cash and governors are looking for ways to care for their people without cutting programs. Medicaid financing is half from federal taxes and half from individual states. The program should have been completely federally financed from the start. Although the cost of Medicaid health services is controlled by each state, the overall cost of the program is rising. No one is insulated from the skyrocketing costs resulting from the greed of health industry corporations. Bush is cynically telling governors: We don’t have money for Medicaid and other social programs, so take the reduced federal share for Medicaid, combine it with your state contribution, and spend it as you like. This is the real cost of the Iraq war. The combination of Bush’s war budget and tax cuts for the rich is cutting into necessary programs such as Medicaid. • Seventy percent of Medicaid dollars are spent on the elderly and disabled; Medicaid cutbacks are direct attacks on these vulnerable populations. If Medicaid programs are more expensive than they should be, it’s because we are always paying for profit. The solution is not to kill Medicaid. The solution is a federally funded, national program that provides comprehensive health care for everyone in the United States. • Medicaid finances our larger health care system. It is estimated that 70 percent of all hospital revenues are from Medicare and Medicaid dollars. Public, private not-for-profit, or private for-profit hospitals fight over these dollars, a lot of which then go to administration and marketing, rather than to patient care. Same solution as the point above. • While all health care costs are growing, Medicaid costs are actually growing less than private plans because they are regulated. Arbitrary budget cuts aren’t “cost containment” — they’re health care cuts. Bush’s budget cuts and block grant scheme are designed to bleed Medicaid to death, not save money. • Local governments across the country are bearing the brunt of an out-of-control, for-profit health care system. Expanding and strengthening Medicaid would actually save money. Keeping people whole and healthy is the best cost-containment system there is. All across the country, coalitions are gearing up to do battle with the Bush administration over Medicaid. These struggles represent a deeply committed, community-based, working-class movement that can be brought into the broader fight for a real national health care plan. Find out who is doing what in your state. As a nurse in Arizona whose disabled son’s health care is threatened by Bush’s Medicaid cuts said, “The role of government is to provide basic services and to take care of those people who can’t take care of themselves.” We won Medicaid in the ’60s. We can save it now.